Is there anything else I should clone from github to run qtcharts? Hi! Qt Charts is now part of the official release, just update to Qt 5.7. @JosephC Add QT += charts in your .pro file and Run qmake. @JosephC Did you install QtCharts after updating to 5.7? It looks like it is not installed by default and is listed as a module under Qt5.7 node in Qt Maintenance Tool. 09:43:45: The process "/usr/bin/make" exited with code 2. After that I was able to build my Project. 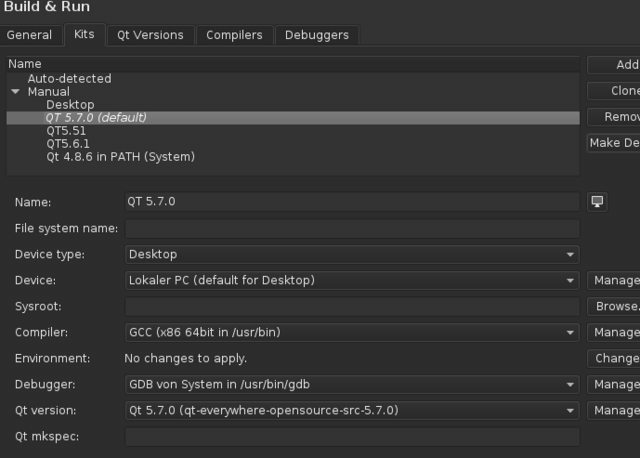 @pauledd Do you really need to build Qt by yourself? Qt 5.7 binaries already contain QtCharts - you can install both using Qt Maintenance Tool. @jsulm I used no binaries, I compiled everything from source. But it still doesnt work. I cant create a QLineSeries Object. I will try the binaries now. Maybe I choose the wrong license? I just read that QtCharts is available in GPLV2/GPLV3 but NOT in LGPLV3. I tried the binary package but I get the same error. 11:29:41: The process "/usr/bin/make" exited with code 2.